Kindly provided by Nicky Parry of Tufts Veterinary School. An aged hamster with a swollen abdomen. What is a possible pathogenesis? 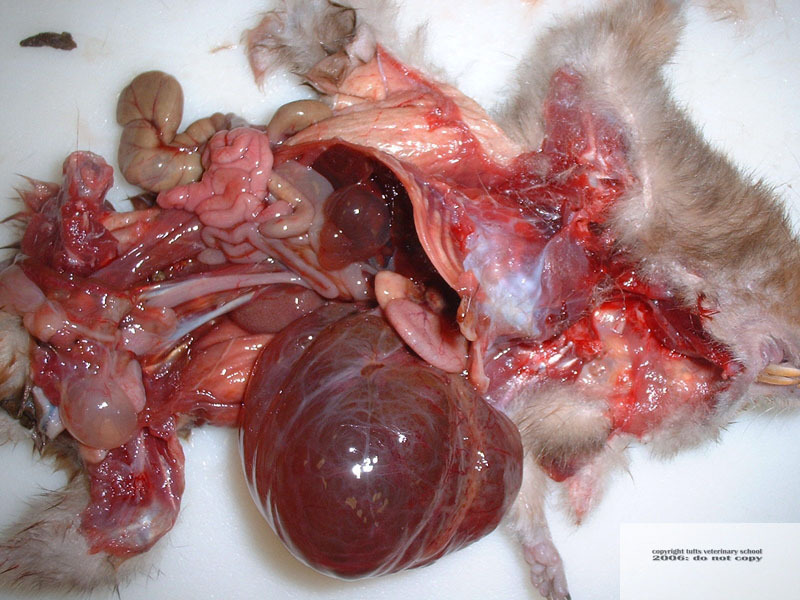 Multiple hepatic cysts are not uncommonly found at postmortem examination as incidental findings in aged hamsters. Grossly they appear as variably sized cysts that arise from the capsular surface and may extend into the parenchyma itself. Cystic lesions may also be found simultaneously in other organs such as pancreas, epididymis, endometrium or seminal vesicles. Microscopically these cysts are thin walled and supported on a fine fibrovascular connective tissue stroma and are lined by cuboidal or flattened epithelial cells. Their lumina can contain proteinaceous fluid material. Their exact pathogenesis is not completely understood, but they are suspected to be congenital lesions and due either to failure of fusion of intralobular/interlobular ducts or due to failure of superfluous bile ducts to disappear.